Recently the Los Angeles City Center Holiday Inn was totally renovated inside and out. Located in a prime position opposite the Los Angeles Convention Center and juxtaposed to the Sports Arena, the venerable building has been made over to be fit for the 21st Century. An important and integral part of the renovation was the installation of 13,000 square feet of solar control window film to the windows facing east and west. 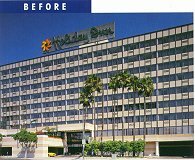 The selected Llumar Window Film gave the Holiday Inn a three-fold return on its investment - it transformed the looks of the building - it curtailed the heat entering and leaving this glass and it protected the valuable, new interior furnishings from premature fading. The new furnishings range from colorful carpets and bed spreads to printed wallpapers and traditional wood furniture. To complement the Holiday Inn corporate logo signage, Llumar Window Film was custom tinted green to showcase a totally uniform, aesthetic exterior. Llumar DL- 30-GR window film rejects 54% of total solar energy and 99% of the sun's damaging ultraviolet rays, thereby helping to prevent interior furnishings from fading and heat damage. 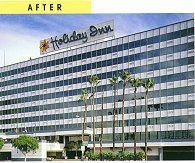 Holiday Inn's Chief Engineer, Gerry Berman, has received many calls from Los Angeleans asking what had happened to the building." I hardly recognized the Holiday Inn. What a major improvement!" was the tenor of all the calls. But, Mr. Berman added, that the practical considerations of energy savings and the virtual elimination of ultraviolet radiation providing more comfortable guest rooms were also primary reasons for the installation of window film.